If you are considering dental implants to correct your tooth loss while improving the appearance of your smile, you have made a great decision. However, the process of getting dental implants can be a long one. While the end results are well worth the time and effort that you will need to put into the dental implant process, it is important that you are well aware of the timeline associated with this treatment option. Remember that treatment times vary, so your individual progress and healing times will also be a factor in how quickly you move through treatment. 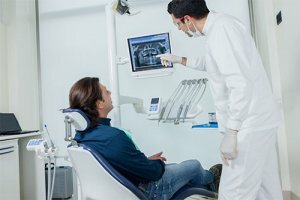 During your initial consultation, we will perform a detailed examination of your mouth and take x-rays to gather vital information and ensure you are a viable candidate for dental implants. Before the dental implant procedure occurs, we need to create adequate space for the implant in your jaw bone. This process is called site preparation. Using a drill, we gradually increase the size of the osteotomy until it is just right for the implant. Once we have made sufficient space for the implant in your jawbone, the titanium implant can be placed. After it is placed in the bone, the gum tissue is sutured around the implant and healing begins. After your implant is placed, it will take anywhere from three to six months to heal from the surgery. While your jaw heals, osseointergration will occur. This means that the implant will bond to and integrate with your jawbone. When the recovery period is complete, your implant is fully secure in the mouth and ready to receive the new tooth replacement. Before you get your new teeth your dentist will take an impression of your now healed and stable implants. A laboratory technician then fabricates your new tooth in a dental laboratory. Once the permanent fixture is put into place, your gums will begin to grow around it, helping to blend in with the rest of your natural teeth. Once your dental implant has been restored, you are able to enjoy your new teeth and all the benefits of a complete smile once again. When cared for properly, dental implants can last a lifetime. For more information about dental implants, contact Prestige Oral Surgery at 732-297-7000.